More at home in a gentlemen’s club with a tumbler of whisky soda at his elbow, our intrepid Cigar Editor Nick Hammond finds himself the wrong end of a tree. Attached to a thin piece of wire. 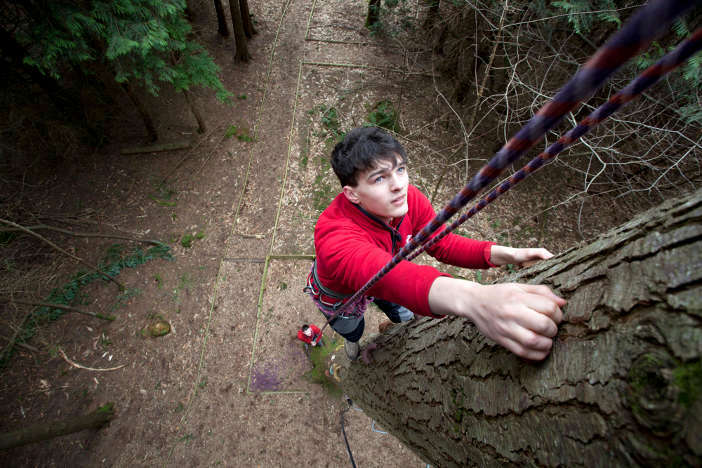 Ever fancied plunging down a zipwire from a 60ft tree trunk? Or climbing in the canopy, learning to use a bow and arrow and generally making out like Robin Hood, all in a morning’s work? Well neither have I, to be frank. Which is why, when confronted with a trip to Tamar Trails in Cornwall, I was a little reticent. Until the kids forced me into it. A gentle stroll around cooling broad-leaf woodlands overlooking the Tamar Valley – what could be nicer on a balmy early summer morning? But no, the little horrors wanted danger, excitement, thrill and adventure around every blasted bush and so it is, dear reader, that I find myself clambering up a very tall, straight pine tree, grasping metal staples and pulling myself up foot by breathless foot. I am of course harnessed to the aforementioned tree, but this does not allay the pace of my beating heart. I am not one of nature’s born climbers. Nor am I normally one for extreme sports. The only extreme link between me and sport is that I once shocked fellow spectators by ordering a mint choc chip ice cone during a somnambulant afternoon at a Test Match. So you can well imagine my trepidation as I negotiated the final few metres of this not insignificant climb (I believe the platform was set at 60ft up) and, panting, still managed a reasonably polite hello to the bearded, steel-toned guide who welcomed me aboard. A quick exchange of harness chicanery later and it is, he assures me, a simple matter of hurling myself off the platform and enjoying the exhilarating ride to the bottom, somewhere in the distant periphery of my vision. All well and good, you cry – but I am not prone to hurling myself out of perfectly serviceable trees at the whim of a bearded outdoor type, however friendly his repartee. I shuffle forwards a little, ask some more inane questions, but try as I might, I simply cannot bring myself to jump out of the tree. How suiciders do it, I’ll never know. I peer downwards and below is my wife, my two daughters and my 18-year-old nephew, all jeering at my cowardly reticence. It’s enough to stiffen the blood and I leap (actually I sit down and shuffle) from the platform into the air. This wire really does zip. I hurtle earthwards, narrowly missing large, hard looking objects like trees and within a second or two am being dragged through the leaf mould on my backside as I come to an undignified halt. Thank God for that. Once unbuckled, I pronounce I have done my bit and will not be participating in future events of this nature. And by Jove, I jolly well mean it because it was rather – how can one put it politely? – stimulating. Of course my nine-year-old stunt daughter clambers nimbly up the tree and leaps into the void with a cry of ‘Awesome!’; my six-year-old, who can barely reach the rungs let alone climb them, bravely zips down to arrive at the bottom a little green around the gills; and my nephew, who is limping and sporting a gash in his jeans due, I’m told, to an incident concerning a shopping trolley and a night in a local club, careers down the wire once he’s negotiated the difficulty of climbing a tree without bending one of your legs. 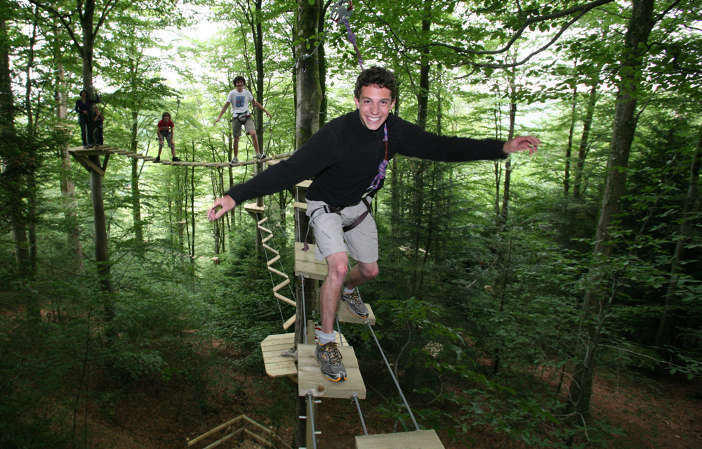 Tree surfing is just one of the many activities on offer at the impressive Tamar Trails site between Callington and Tavistock. You can walk, bike, canoe, find old tin mines, explore, hike and more in this stunning area on the Devon/Cornwall border. There is an extensive network of aerial walkways, designed to test the nerve and exhilarate the senses, but the only testing and exhilarating I was going to contemplate from now on was the taste and sensation of the coffee and buns in the café. And excellent they were too, I’m pleased to report. The kids enjoyed an archery session and a trail around the beautiful woods. I was left contemplating my own mortality over a cup of steaming Java. For more information about the Tamar Trails, visit the website.